Satya during a lighter moment at the Grace Hopper event. Last week, after Satya made his disastrous, albeit insightful (into his thought process, anyway) comments at the Grace Hopper Convention, I had several folks reach out to ask for my opinion on the topic. Initially, I demurred, saying that everything worth saying would likely be said once Twitter was done with him, not to mention the New York Times, Time, Business Week, Forbes, TechCrunch, the Puget Sound Business Journal, and every other news outlet with a business desk. But then I thought- am I playing into the stereotype by letting others speak for me? After all, I believe in speaking up! I believe in asking for what you want! I believe in asking for stretch assignments! I believe in being vulnerable and seeing what happens! I believe in taking risks! My approach has worked… over the long run. I guess you could call that karma…. but it’s the kind of karma that has a lot of elbow grease behind it. Not to mention, that I have taken some pretty good sized hits because of it too. But getting back up has a virtue all it’s own. Just ask Michael Jordan. I’d liken my relationship to karma to that famous quote by Jack Nicklaus, “The more I practice, the luckier I get.” Turns out- the more I speak up, the more ALL women speak up, the more likely we’ll be listened to. So, in that spirit, I will share my thoughts on #karmagate. I was disappointed though not surprised by Satya’s comments because I think they are a reflection of his reality up to this point in his career. I certainly wish that “karma” worked as well as Satya believes (believed?) that it does! Unfortunately, history has shown that relying on karma is not a sufficiently robust “tool” for the management of one’s career- particularly if you are a woman, person of color, or an older job seeker. My hope is that Satya’s comments and the subsequent firestorm cause him to reflect upon the unconscious bias and assumptions that have underpinned his views. In fact, I’d love to see him push his entire leadership team to reflect upon and uncover the unconscious/unintended biases that may drive their views and decisions. I hope with some study of the issue and a broader set of inputs- he’ll emerge from this as a more proactive advocate for change within Microsoft and the industry. As Nilofer Merchant said in her piece for Time, by putting the onus on “the industry,” he is distancing himself and Microsoft from taking a leadership role in fixing this problem. 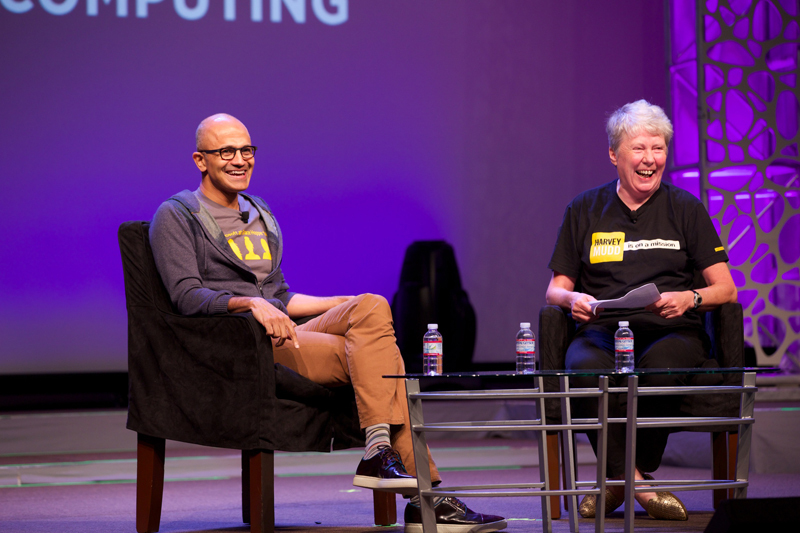 I’d like to see him commit to putting Microsoft front and center in the drive for gender equity in the workplace. His biggest takeaway from this experience may be that bias is a sneaky adversary. You may think you are taking a very clear-eyed view of an issue, only to get smacked in the face with a Mack truck of unconscious bias. I hope he dedicates himself to watching for bias in his views and pushes his team to do the same. He made a strong first step by admitting fault (though his carefully worded response was a little protectionist). One of my favorite sayings is “It’s not the mistakes we make that people remember, but how we recover from them.” So, here is his chance to make a memorable recovery. A single step doesn’t note make a journey, and we will all see where this leads him. The other thing I think is interesting out of this debacle is how Satya’s comments (and that view about speaking up generally) intersect with other women’s/gender issues. In my blog post on Emma Watson’s speech at the UN, I took issue with what I thought was her overly conciliatory language. She “invites” men to join us in the quest for gender equity. “Invite” is about as passive and subordinate an action verb you can find. As much as I admired her making the speech at all, it left me wanting more. In the business world, there is definitely a strong undercurrent that pushes women to minimize the use of strong (often code-worded as “inflammatory”) language. I have many times been asked to “tone it down”. And yes, it feels patronizing every time I hear it. The worst part about it though, is that statements like that are a subtle thief of an individual’s power because they take it away by degrees rather than all at once. Satya’s gaffe has held up an important mirror that we can all reflect in. What biases are we unknowingly incorporating into the way each of us talks, thinks, and views the world? I appreciate your comments, shares, and feedback! Tell me what YOU think! I was in my favorite place on earth, Winthrop, WA, a few weeks back to celebrate the 4th of July. Winthrop is charming, rustic, Western-themed town that today continues the tradition of being a hub for ranchers and farmers, and importantly has transitioned into a tourist destination for those seeking active getaways in a beautiful valley. On a busy summer weekend, every car on the street will bristle with all manner of outdoorsy paraphernalia from mountain & road bikes, to kayaks and inner tubes, to camping and hunting gear, bulging from Thule roof racks. We were enjoying a break from mountain biking ourselves, strolling down the diminutive main drag, ducking in and out of the shops, without a care in the world- when it happened. One moment I was saying something to my 6 1/2 year old daughter, and the next moment I was staring at a gun. Now, it wasn’t pointed at me, but it was about eight inches from my daughters face, so to say my heart skipped a beat is an understatement. It was as out of place as if someone had walked up and slapped me. The man in front of me was participating in the practice known as open carry. As in, I have a gun stuck in the back of my pants and I want you to know it. The gun was in some kind of fanny-pack (he’d call it a holster) and it was perched there like a flower stuck in a vase- a very deadly flower. My initial reaction was shock followed quickly by anger. Then, almost as quickly as he was in front of me, he was gone. He turned into the next shop and we kept moving down the block toward our destination. However brief that moment was, it was a lightening strike. As bright and harsh as a fiery bolt of electricity, it illuminated in a flash why open carry is so harmful. Let me state emphatically- I am not opposed to gun-ownership and I am a supporter of intelligent gun rights. Please don’t read any secret agenda into that- I truly support the right to bear arms and given the chance, I’ll happily have a dialogue about the parameters that should be implemented to ensure everyone who wishes to, can enjoy and own guns safely. The comparison to car ownership and operation may seem like a cliched argument (and may not be enshrined in the constitution- because let’s be honest, it would be an amendment about horse ownership) but it is incredibly relevant and apt. I’ll come back to that in a little bit. In fact, NYT Opinion Columnist, Nicholas Kristof, just had some great thoughts about this idea. Like most Americans, I have many friends who are hunters and frankly, if you are a meat eater, you are a bit of a hypocrite if you don’t support hunters. I admire the ability to dress a kill and have enjoyed the fruits of these endeavors (whether as jerky or steaks). When the zombie apocalypse happens, I’ll be glad to count these folks as friends. Further, I have many friends who enjoy owning a handgun and although we may argue about whether or not possessing a gun actually makes them safer- in many ways that’s beside the point, they have the right to own a firearm. Not to mention, the United States has the highest rate of firearm ownership in the world, 97 guns for every 100 people; 50% more than the next two closest countries (those paragons of civil society, Serbia & Yemen)- so to a very real degree, regardless of your feelings on the subject- guns are here to stay. No one (at least not me) is arguing that fact. What I do want to address is the impact of reducing the complex issue of gun regulation to a one-dimensional “all or nothing” argument. It’s ridiculous. We should feel embarrassed as a nation to allow that kind of shallow invocation to distract us from the real opportunity and need in front of us. We must find a way, both in terms of our laws and more importantly, in our attitudes and social mores, to ensure public safety and security. To do nothing is selfish, arrogant, and short-sighted. One place to begin is with a careful look at the impact of open carry on social dynamics, freedom of speech, and safety. Back to that moment in the sun in Winthrop. Recall, the open carry individual and I didn’t even make eye contact, though my first impulse was to reach out and tap him on the shoulder. I wanted to ask him, “What the HELL are you thinking?” How dare you introduce that kind of threat into our peaceful afternoon? What if my daughter had tripped and instinctively reached in front of her to catch herself? What if I had tripped (a pretty common occurrence) and stumbled into him? What if he thought I was a threat? An unarmed person, even one spoiling for a fight, would do no more than push me, but this guy- who’s arrogance and slavish devotion to belief puts every member of the community at a very real physical disadvantage. He could shoot me. He could KILL me. In front of my daughter. And he might even successfully claim it was self-defense. That’s the reality we invite when we tolerate open-carry in the public sphere. It’s important to note that in Washington State, open carry is legal (even without a permit), so this man wasn’t legally doing anything wrong, but he was in a very tangible way, impacting every person around him, by destabilizing the dynamics of power, community, and freedom from fear that our society relies upon to function. Critics may move to dismiss my assertion as hysterical or naive, but that’s the lazy voice of misdirection. The crux of the issue is this: when one person has a gun and another doesn’t, the person without a gun has less power, less voice, and in point of fact, can be under threat of death in an instant. Standing eight inches behind that open carry person as a pedestrian, I was “safe”. However, I have no doubt that I could have provoked the guy into shooting me (perhaps with words alone) and that is not okay. It is not okay that my ability to speak and move about on a public street was limited because one guy had a pointless point to make. The other lazy answer to this is to arm *both* people. But we know that’s a violence multiplier, not a violence reducer. It’s bananas to think that any rational person would want to live in a society where we all walk around armed. Back to the cars vs. guns analogy. Although the right to own a car is not in the Constitution (again, it would be a horse amendment), US car ownership is on par with gun ownership; particularly with respect to other nations. We have the highest level of car ownership in the world. Car ownership and what it represents in real terms and psychologically, is vitally important to America and yet, we have a whole body of comprehensive laws that folks are more or less happy with and abide by. It is not only against the law to drive on the sidewalk in the US, but it’s also socially unacceptable. You may laugh, but that’s NOT true in all other countries. Social norms in Kenya (where I lived as a Peace Corps volunteer), dictate that cars can drive wherever they can fit- sidewalks, center dividers, into on-coming traffic- whatever they can get away with. Through enforcement of our laws and our social norms, we have made car ownership a reasonably safe and regulated prospect. Insurance, training, safety features, consumer protections. Remember when seat belts weren’t mandatory in cars? Okay, me neither- the law was changed in 1968, but I DO remember when it became the law to *wear* a seat belt in California in the mid ’80’s. Only someone grossly out of touch with reality would *ever* suggest we abolish cars in the United States. It’s not even a serious conversation, BUT it is a good discussion to talk about ways to continue to improve safety, efficiency, affordability, and alternate methods of transportation. The same holds true for gun legislation. Criminal background checks for gun buyers has overwhelming popular support among Republicans and Democrats and yet it becomes Kryptonite the minute Capitol Hill goes near it. And it’s true- no one piece of legislation will be a silver bullet (see what I did there? ), but again, that’s beside the point. That’s like saying that seat belts don’t save ALL the lives, so let’s just forget them. We must take some moderate, common sense steps toward improving the safety and security of guns for the benefit all Americans. Changing our attitudes and laws takes courage and it will, ultimately take trust. So I am taking a first step, gathering my courage and showing trust. It was difficult for me to write this post. I had to consider whether someone might decide that my voice, my words, would be considered a threat to their “security” or “freedom”. In writing this, do I put my family at risk? As a parent, this is a sickening question to ponder. But the answer is- if I don’t speak up, if I don’t advocate for common sense, if I don’t call for the nation to join together in support of safety for all, in conjunction with (not at the expense of) the rights of the individual, who will? There are many individuals and organizations doing this, but we haven’t seen the groundswell of moral conviction and support that must be present to change, not just the laws, but our society itself. Again- it’s crucial to reject the urge to marginalize or derail progress by sounding the “slippery slope” alarm. It’s a specious cry and one that Americans must step up and prove that we are smarter than. So, my call to action? Share this post, comment on this post, write your own post. Get involved. Add your voice. Conventional wisdom would say call your senator or representative, but maybe it’s time to expand our approach. Contact your local gun store, contact your local NRA chapter, your hunting club, your shooting range. Contact the gun manufacturers- tell them you will support the makers and sellers who are committed to responsible gun ownership. As for my encounter in Winthrop? It was a grim reminder of what we are allowing to become “the norm” in the public sphere. Don't want to miss a post? Follow here! Enter your email address to follow this blog and receive notifications of new posts by email. You'll make my day!